Oh no! Your kitchen is infested with mice! What are you going to do? Why nibble their noses, of course! 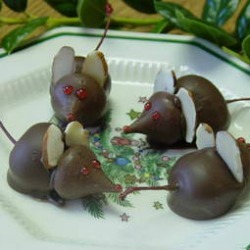 These adorable and delectable Chocolate Cherry Mice from McJulio-O have been a long-time favorite of Craftster members. The mice are so easy to make. You don’t need to be a master chocolatier to create these cuties. They are great last minute gifts for just about everyone. Decorate a gift box and give the mice a new home. They are also a perfect treat for parties. Have fun this winter with tutorials from our Winter Holiday and Occasions Board. Don’t forget to have a crafty terrific Tuesday! Christmas isn’t complete without these babies! They are a classic. Thanks for featuring them!